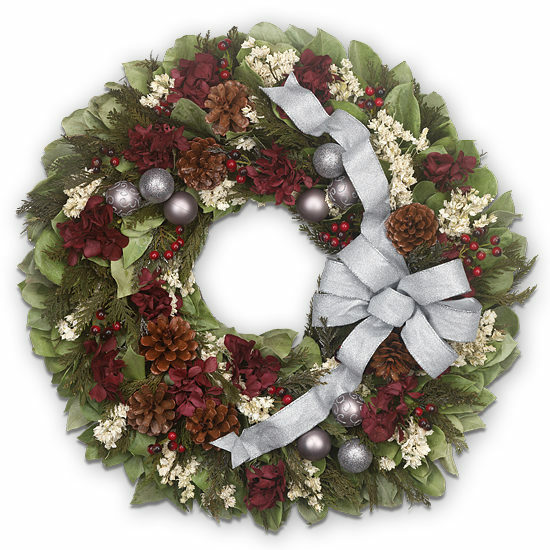 Cause for celebration, this beautiful Christmas wreath is thoughtfully designed to be admired from near and far. Handmade on a natural twig base, feathery preserved cedar and leaves provide a bed for tufts of crimson hydrangea, sprigs of white statice and pinecones. Clusters of faux winter berries, ornaments and a meandering bow in frosty silver fill out the wreath which will remain vibrant through years of festivities.